In November 1956 the legendary Decca producer John Culshaw with his engineers Kenneth Wilkinson and Roy Wallace recorded three Stravinsky scores in the Salle Wagram, Paris. Featuring Pierre Monteux and the [Paris] Conservatoire the celebrated recordings of Firebird and Petrouchka were issued on LP – mono (LM2113) and in RCA’s Living Stereo (VICS 1027). They have always been a part of the American record buyers’ heritage. They were issued in the UK on Decca LPs and in 2006 on a 7-CD box set 475 7798 “Pierre Monteux: Decca and Philips Recordings 1956-1964 including The Rite of Spring. The original coupling of Petrouchka and The Firebird Suite is currently in print on an audiophile 200 gram pure vinyl LP issued in Classic Records’ RCA Living Stereo series; fully-analogue it is the best possible sound on the right turntable. The Rite of Spring and The Firebird Suite are coupled on one CD by HDTT (High Definition Tape Transfers) on the review sample HDCD105. It is unusual because it was transferred from a commercial open-reel tape. The notes are sparse and inaccurate; the music was not recorded in 1958, as stated. The recent reissue on LP couples two stunning performances in superb stereo; confirming its golden age of simple tubed equipment, and the Decca genius. The remastering and 200 gram Quiex pressing make this a treasured possession. It is an exact replica of the original; no mention, dating, or logos of the reissuer. Minor problem: side layout is not indicated on sleeve and the labels have it wrong: Firebird opens side one, not closes side two. However, the audiophile LP is a glorious treasure, so I was shocked, and carefully checked, unable to believe my ears that the HDTT on a 16-bit CD comes so close as to be virtually indistinguishable. I surrender all of my audiophile credentials; after 30 years I will leave the club. I am not going deaf and I stand by my observation. HDTT uses high-grade sources, equipment, and expertise: so interpret amateur as meaning done for the love of the art and despise the big record labels poor offerings. Disturbingly, I find that CD reproduction depends unpredictably on replay equipment; I am sure it is due to the voicing of the final mix on at least four families of studio monitors. If you use the same loudspeakers at home, the sound is “just right”. 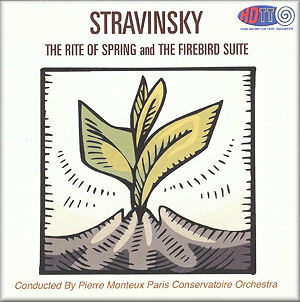 The LP coupling is better than the audiophile CD because I do not think Monteux was at all comfortable in the pagan rituals of The Rite of Spring. By far the finest demonstration quality sound I have heard - and I own many versions - is Esa-Pekka Salonen’s Rite with the Los Angeles on DG 00289 477 6198 issued in 2006. It is tragic and unforgivable that Universal Classics quickly abandoned the SACD format after such a triumph and most of Salonen’s recordings were then issued on CD or (worse) download. For this reason the small and amateur labels are crushing the uncouth corporates to a well-deserved extinction. The HDTT CD looks amateurish and poorly annotated. In my opinion, $19.95 is worth paying for the remarkable performance of The Firebird Suite. With Monteux it unfolds with exquisite beauty, captivating the listener, then propelling him or her into volcanic fury. Thanks to HDTT, you can hear a bygone era of French orchestral sound and style. It is not a modern demo disc with impressive dynamics but gloriously natural sound. For this reason, not to be missed. Buy it while you can. I am amazed that the transfer from an issued tape works so well. HDTT are onto something and I look forward to more titles.